This Website may contain links to third party websites, and if you access them then their policies will apply for the duration of your access to them. Any data or information you supply to Thunderhead.com must comply with English Law and not defame any third party. You are responsible for any information that you provide or post on our Website. “Thunderhead” means Thunderhead Ltd and all its subsidiaries and affiliates. Thunderhead Limited is registered in England under No. 4303041 with a registered office at Ingeni Building 17 Broadwick Street London W1F 0DF. 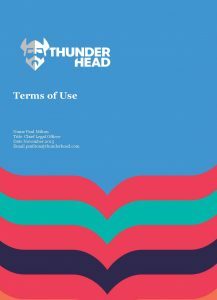 This Website contains Copyright, Intellectual Property and Trade Marks, belonging to, or licenced or authorised and acknowledged for the use by Thunderhead unless otherwise noted. Copyright and Intellectual Property exists but is not limited in the screen design, method of operation and functionality. You must not link our Website to any other website without our prior permission. You are not permitted to make any changes to our Website that is outside that of normal use of the Website and its contents. Any use of our Website must be appropriately acknowledged. If you copy any of our content it must be for your own personal i.e. non-commercial use. You are permitted to temporarily store extracts, copy items from our Website for your personal information or for when you use our products and services. THUNDERHEAD®, THUNDERHEAD NOW ®, THUNDERCLOUD ® (United States only), ONE CORRESPOND ®, ONE logo, THUNDER HEAD logo, ONE ENGAGEMENT HUB ®and the THUNDERHEAD.COM logo ® are all trademarks or registered trademarks of Thunderhead in the EU, United States and/or other countries Unauthorised use of this Website or any of the intellectual property rights held by Thunderhead may give rise to an injunction and to a claim for damages and legal costs and may be a civil and/or criminal offence.